Lovin’ this game. 2friends turned me on to it. Telling others to check it out!-Doug e.
Thanks Doug! We really appreciate it. Installed app, purchased best package, how do I sign in and create ID? Go to the home page on your device. Tap on the Game Center icon. Enter your Apple ID and password. This should create your Game Center account. 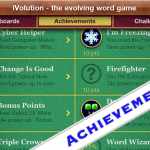 Once you’ve set this up you should be able to see your iVolution achievements and leaderboards. You can also now challenge your friends to online matches. If you purchased “The Works” package, you should now have a golden piggy bank that will never run out of tokens. 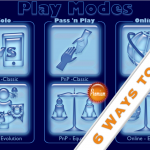 You should also be able to play the 2 premium “Equality” game modes. Enjoying iVolution; how do i create an avatar for this game? I’ve seen that others I’ve played with online have them. Go to the main screen on your device and press the Game Center icon. Next tap the Polaroid graphic to the the right of your Game Center name. A pop up window will now give you the option to choose or take a photo. This will become your Game Center avatar. The game keeps crashing, even after rebooting my phone. Is there any solution to this? At long last, I have found and fixed the nasty crash bug that happens after selecting a new word seed!! The update will hopefully be available for download in about 1 week. In the meanwhile, please use this workaround: After you select a new word seed ONLY touch the purple check button. Do not touch the blue semi-transparent graphic with the word iVolution on it that slides up and covers the bottom keyboard letter tiles. Touching this “keyboard cover” area on the screen after selecting a new word seed will cause the app to abruptly shut down. I’ll try that, but it crashed any time, not just when choosing a new word seed. Thanks! Can you remember what you were doing immediately before the game crashed? Also you might try deleting the game and then reinstalling a free copy.